From hot topics to state taxes, find the research resources you need to stay compliant for your clients. Tax Cut & Jobs Act Book Close Out Sale! We are slashing the price on previous year research books. Get any of the below books for 50% off until we run out. Get them while they last! With the publication of this title, tax and accounting professionals will have access to a single, integrated source for law and explanation of the tax provisions of the important 2017 tax reform legislation. Individual taxpayers are more impacted by the provisions of the act than any other class of taxpayer. 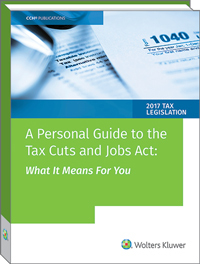 This book provides easy-to-understand guidance on the immediate and long-term impact of the Tax Cuts and Jobs Act for individual taxpayers so they can make decisions to maximize their tax benefits and minimize their tax liability. This book includes clear explanations of the key components of this landmark legislation, important tax provisions, along with comments and helpful graphics. With this report, you will have access to the full text of the Tax Cuts and Jobs Act and the Joint Explanatory Statement of the Conference Committee. In addition, gain in-depth explanation of the current law, the changes made and when each of these changes will go into effect. 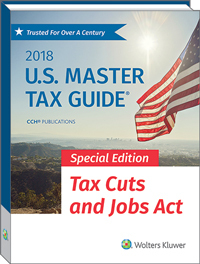 The all-new U.S. Master Tax Guide (2018) Special Edition — Tax Cuts and Jobs Act has been updated exclusively to provide complete and reliable guidance on the historic Tax Cuts and Jobs Act — the most sweeping change to the U.S. tax code in decades. Virtually all taxpayers are impacted by this bill, with individual taxpayers, corporations, small businesses and pass-through entities witnessing the most significant changes. By preparing now, you can gain complete understanding and knowledge of the major provisions and ensure the most proficient tax services are provided to your clients. 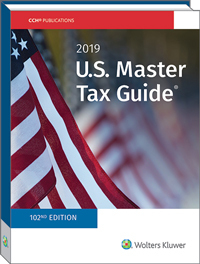 The U.S. Master Tax Guide provides helpful and practical guidance on today's federal tax law. This 102nd Edition reflects all pertinent federal taxation changes that affect 2018 returns and provides fast and reliable answers to tax questions affecting individuals and business income tax. Saving time, especially during tax season, is important! The TaxBook Deluxe provides a concise, easy-to-understand topical summary of key tax laws and rules for tax preparation. Round-out your tax research library with these reference guides in a tabbed fast-answer format. Content includes the entire 1040 Edition plus C Corporations, S Corporations, Partnerships, Estates, Trusts, and more. Saving time, especially during tax season, is important! The TaxBook 1040 provides a concise, easy-to-understand topical summary of key tax laws and rules for tax preparation. Round-out your tax research library with these reference guides in a tabbed fast-answer format. Fast answers to your income tax questions! Find information on common and not-so-common IRS forms and schedules. The TaxBook All States edition is the perfect book for tax preparers that prepare out-of-state returns. This book contains fast answers to state specific individual tax questions. Content includes individual tax rates, filing requirements, additions, subtractions, adjustments, exemptions, credits, and more for each state. The U.S. Master Depreciation Guide offers tax and accounting professionals who work with businesses a one-stop resource for guidance in understanding and applying the complex depreciation rules to their fixed assets. The perfect quick-answer tool for tax practitioners and business professionals who work with multiple state tax jurisdictions. Widely used by practitioners and all those involved in California taxes, this time-saving guide is accepted as the premier source for quick reference to all taxes levied by the state. 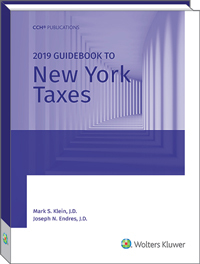 This is the perfect resource for concise explanation for practitioners working with state taxation in New York. The perfect resource for concise explanation for practitioners working with state taxation in Texas. The perfect resource for concise explanation for practitioners working with state taxation in Florida, presenting succinct discussions of state and local taxes. The perfect resource for concise explanation for practitioners working with state taxation in Illinois, presenting succinct discussions of state and local taxes. The perfect resource for concise explanation for practitioners working with state taxation in Pennsylvania. The perfect resource for concise explanation for practitioners working with state taxation in Massachusetts, presenting succinct discussions of state and local taxes. The perfect resource for concise explanation for practitioners working with state taxation in Michigan. 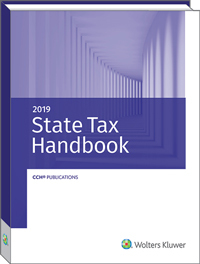 The perfect resource for concise explanation for practitioners working with state taxation in New Jersey, presenting succinct discussions of state and local taxes. The perfect resource for concise explanation for practitioners working with state taxation in North Carolina, presenting succinct discussions of state and local taxes. OFFER: Offer good until 5/31/2019 or while supplies last, for online purchases only. 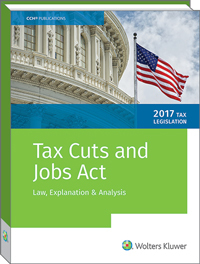 The Tax Cuts & Jobs Act Book Close Out promotion of 50% off select books includes the following CCH® Publications: Tax Cuts and Jobs Act of 2017: Law Explanation and Analysis, A Personal Guide to the Tax Cuts and Jobs Act: What It Means For You, Tax Legislation 2017: Highlights of the Tax Cuts and Jobs Act, Conference Report: Tax Cuts and Jobs Act of 2017 and the U.S. Master Tax Guide® (2018) Special Edition – Tax Cuts and Jobs Act. This offer is non-transferable, not for resale and may not be combined with other offers, special promos, renewal discounts, discounts or multi-year price locks. New transactions only, not valid for previously purchased books. Offer excludes any services or goods not expressly stated here as being provided. Purchases of the books and related services discussed herein are subject to the terms and conditions of the applicable license agreements, other applicable requirements and the refund policy (See https://taxna.wolterskluwer.com/legal). Wolters Kluwer reserves the right to modify or limit this offer in its sole discretion.